I’m currently on holiday (I love using that term, I feel so refined!) in central Florida, and despite having tickets to various parks the weather has been too cold (I blame my tropical constitution). So instead we’ve been visiting family and practicing that most sacred holiday tradition, shopping! And while I have done some normal shopping, what sort of gamer would I be if I did not scour for game stores? So here is a rundown of the two stores I visited in the central Florida area. My first stop was at Sci-Fi City in Orlando. I love this store; I’ve been visiting it for years. I call it my favorite attraction; some people come to Florida for Disney, I come for this store! It has a great selection of role playing games, miniature games, minis, paints, comics (all bagged and boarded, a plus), trade paperbacks, dice, collectibles, posters, a LARGE gaming area, computers you can rent, its geek heaven. I have never gamed there mind you; I just visit and walk through the aisles like a 4 year old visiting Toy R Us for the first time. It happens every time! What about RPGs, which was the main reason I went there? They have an excellent selection of new games and older titles. I was searching for Pathfinder RPG book and found to my dismay they were pretty much sold out. They did have a great selection of Savage Worlds games and I stocked up. I got my hands on Slipstream which I have always wanted, a physical copy of Realms of Cthulhu, which I own on PDF and my most precious find Space 1889 Red Sands! It is hard to explain the thrill of holding a new Space 1889 book in my hands. I got the GameMastery Flip-Mat: Prison, the GameMastery Map Pack: Swallowed Whole (a friend had told me it wasn’t that great but I just could not resist getting this), an issue of Knights of the Dinner Table my FGLS had not received and a new set of dice. I would have gotten more stuff, including some board games, if I had extra space in my luggage (and more money), but I am really happy with what I got. They had a GREAT sale, 30% off in most games, so I got some great bargains. The employees at Sci-Fi city are friendly and very helpful. I’ve been visiting the store for years and never have I run into a rude employee. They have other locations I have not visited, and an online store that seems well stocked and with some nice sales, but I have never used their services. 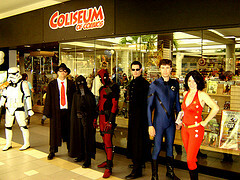 After I was done at Sci-Fi city, and despite my girlfriend’s protestations I went on to another nearby store, Coliseum of Comics at the Fashion Square Mall. This is more a comic store than a gaming store but I could not pass up the opportunity to see what they might have. If you love comics the store is a sight to see. Mind you Sci-Fi City has an equally great selection of comics; coliseum of Comics just looks chick, like a comic boutique with the layout and the decorations and the statues, collectibles, wall of really old back issues. Their trade paperback selection was great, organized impeccably and with great lists and references to let you know which order you had to read what. So what was your holiday gaming loot? What gaming related gifts did you get, or got for yourself? Inquiring gamers want to know! Ask Your Readers: Christmas Gifts for Roleplayers The wonderful world of gaming! Christmas in July Sale at DriveThruRPG! Gaming In Remote Locations: Juneau Alaska Free RPG Day is coming! Previous PostWhat about Advanced Feats: The Cavalier’s Creed? A review…Next PostAsk the Readers: Do you know of any gaming supplements where Puerto Rico is mentioned? I live in Orlando and Sci-Fi City used to be called Enterprise 1701 and was in a small yellow building, it is where I got my first Player’s Handbook 🙂 A great store, I think all comics stores should have an RPG section, and they should buy, sale, trade, older gaming material that would give them some unique stock items. Coliseum of Comics is another great store with some cool figures and a smallish RPG section. Merry Christmas and great blog!!! I remember when it was called Enterprise 1701! I have been coming to Orlando for far too long… It is truly a great place. Thanks for posting; I am glad you like the blog. I have to take a look at Archers and Alchemists! Somewhere in Shadowrun there' has to be a mention of Puerto Rico. Apparetnly the supplements Aztlan, and Cyberpirates mention it as part of the Carribbean League.